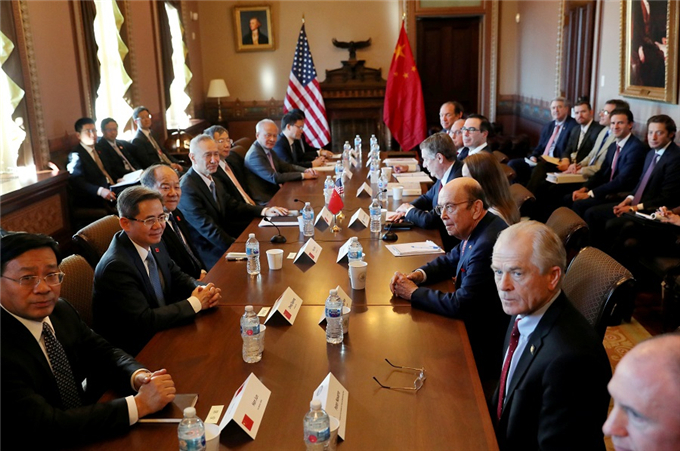 China and the United States started a fresh round of trade talks in Washington on Wednesday to address their differences on outstanding economic and trade issues. Chinese Vice-Premier Liu He, US Trade Representative Robert Lighthizer, and Treasury Secretary Steven Mnuchin attended an opening ceremony of the talks at the Eisenhower Executive Office Building at the White House on Wednesday morning. The trade talks will last until Thursday. They are a continuation of trade meetings held in Beijing Jan 7-9. Liu, also a member of the Political Bureau of the Communist Party of China Central Committee and chief of the Chinese side of the China-US comprehensive economic dialogue, arrived in Washington on Monday afternoon with his delegation. The members include China’s central bank chief Yi Gang, Vice-Chairman of the National Development and Reform Commission Ning Jizhe, Deputy Director of the Office of the Central Commission for Financial and Economic Affairs and Vice-Finance Minister Liao Min, Vice-Foreign Minister Zheng Zeguang, Vice-Minister of Industry and Information Technology Luo Wen, Vice-Minister of Agriculture and Rural Affairs Han Jun, as well as Vice-Minister of Commerce and Deputy China International Trade Representative Wang Shouwen, according to an earlier press release. For the US side, the trade discussions are led by Lighthizer and include Secretary Mnuchin, Commerce Secretary Wilbur Ross, Assistant to the President for Economic Policy Larry Kudlow, and Assistant to the President for Trade and Manufacturing Policy Peter Navarro, according to a White House statement. Beijing and Washington have agreed to suspend any increase in tariffs after a meeting between President Xi Jinping and Trump on the sidelines of the G20 Summit in Buenos Aires, Argentina, on Dec 1. Days after the Argentina meeting, China’s Ministry of Commerce had said that in 90 days, economic and trade teams of both sides would “actively push forward” the consultation following a clear schedule and road map.